Because my family is sort of “bird crazy”, we participate in little projects like the Great Backyard Bird Count. This tally happens every year around this time, and broader technology has allowed more and more people to participate and get more and more accurate data, both quantitatively and qualitatively. It runs Feb 14 – 17 this year. If you are interested, you don’t need any special qualifications to participate. Now, onto our regularly scheduled quilt update. Remember when I suggested back in December that 2014 should be the year we get backlogged projects completed? Well, amazingly, I am making some progress and I hope you are too. Smaller size…should I go bigger? I love the proportions of this as it is laid out…on point with a 5 in. border. But I know that it will lose at least another 5 in. in width and length once it is assembled. I also have a whole lot of this fabric left over, and I wanted this to be queen size. 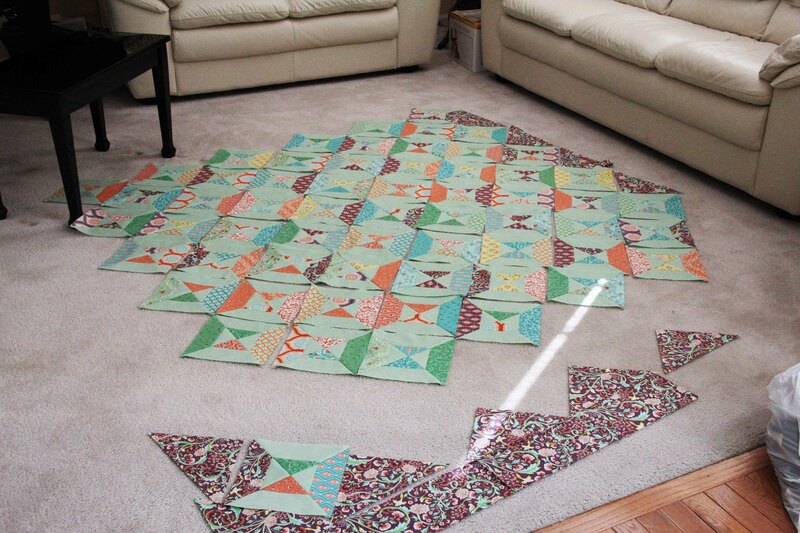 So I am heading back to the sewing room to make a bunch more blocks. I need to add at least 2 rows to achieve the same layout look. At that point I may have to increase the size of the border to hold the proportions. I’ll have to fill it in and see what I think at that point. As you can see, I tend to make up my patterns as I go along. Not to mention, I may be running out of room to lay this out. 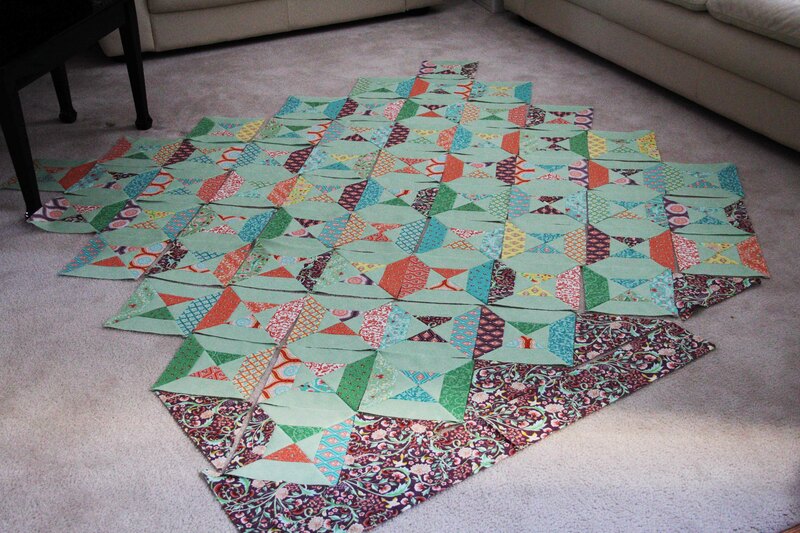 At any rate, this is the quilt I want to finish through hand quilting. I love the look of hand quilting and I love to do it. I just have to resign myself that once this quilt is assembled and laid out in a quilt sandwich, it may take another year for me to complete. But I am looking forward to having something I can sit and do in front of the TV this coming spring and summer. Unfortunately, I don’t normally watch a whole lot of TV. So I’ll be looking for some mildly intelligent series (on PBS maybe?) to follow. If you have any suggestions, I’d love to hear them. So far, I’m thinking “Call the Midwife” and “Mr. Selfridge”. I hope you are making some headway on your piles of projects this winter. I have faith that spring will be here eventually, and we’ll all be out gardening again. Soon. This entry was posted in Creativity by edges. Bookmark the permalink. Call the Midwife for sure! Your quilt is coming along nicely. I say go big or go home. Ha. I am home. But I’m going big anyway.